Keep Your Home World Safe & Secure with the Burglarybuster. 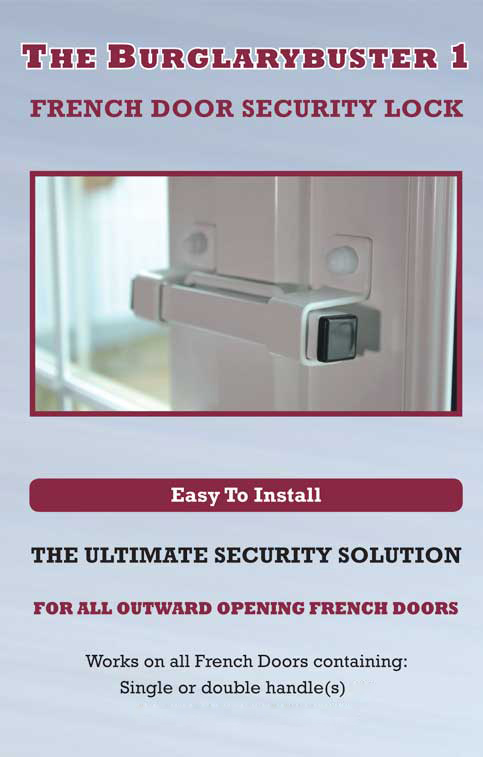 After six years of research and development (to see Our Story click here), we are thrilled to introduce our Burglarybuster Locks - the world’s first ever and widely acclaimed locking devices for effectively securing every type of double French Door and Conservatory Door. 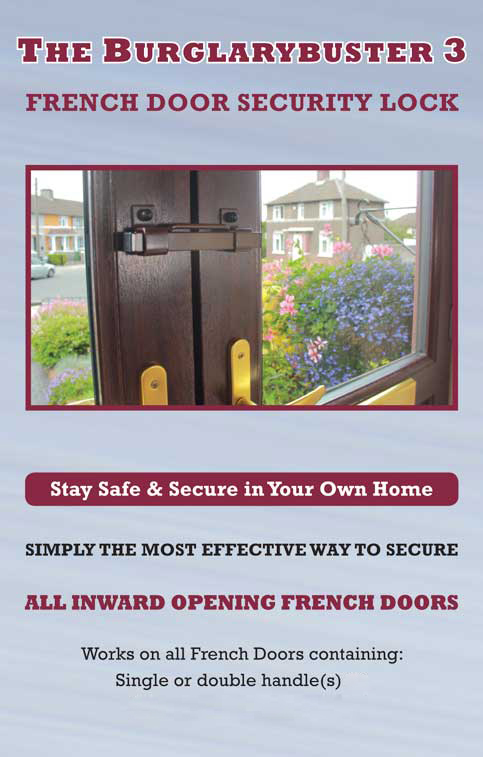 For full product information and also details on How to Secure Single & Double Handled French Doors see SECURING FRENCH DOORS page here. The Burglarybuster Lock 1 is the solution for all opening-outwards French doors including single-handled French doors and the Burglarybuster Lock 3 works on all opening-inwards French doors. An average of one thousand (1000) recorded burglaries per day took place in the UK during 2016. However, it is estimated that at least six hundred extra (600) went unrecorded. Approx. one in every three of these crimes occurred at a time when one or more of the home’s usual residents was in the house. This means that, on average, approximately five hundred and thirty (530) such incidents occurred daily during 2016, with the real danger of injury or worse to a resident of the home. Approx. two in every three of these crimes occurred where unlawful entry was gained through a door. The most vulnerable of these doors is the French Door. Even if a French Door has a multi-point locking system, this door type needs a second (and discreetly positioned) independent strong lock to be secure. The evidence therefore shows that French Doors need a second and last line of defence to protect against burglary. “Having spent several months in Ireland and overseas looking for a means of securing my French door containing one handle I eventually stumbled across your Burglarybuster 1. It was fairly simple to install and works brilliantly and we are really happy with the degree of security it provides. My wife is also very pleased and comments regularly on how neat and effective it is."